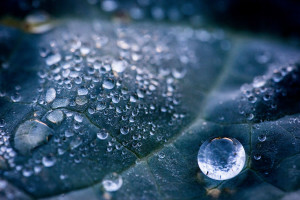 The West Coast is known for many things – from the friendly people to the endless beaches and rugged coastlines. And of course it is home to one of South Africa’s culinary treasures: the West Coast black mussel. 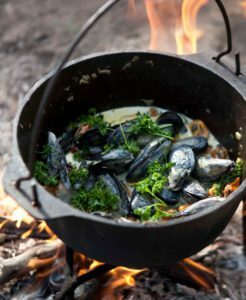 On the scale of taste explosions, not a lot comes close to the full flavour of the black mussel – especially if you make it in a potjie over a fire, serve it with freshly baked bread and eat it with good friends . . . you get the picture. Mussels are really easy to harvest. You don’t need bait. You don’t need to sit around and hope for a bite on the other end of the line. All you need is a knife or screwdriver, tackies (so you don’t cut your feet on the rocks), and either a big hat, a bucket or even a pillowcase for your pickings, and you need a permit (obtainable in SA from the post office). Make sure to check with the local fishermen whether there’s a red tide. Wait for low tide, trek down to the rocky beach and pick as many as you can find, keeping in mind the bag limit of your permit. Here’s what you do. Pretend you’re a klipspringer and make your way down towards the water’s edge. Have your screwdriver or knife ready (hopefully it was safely tucked away in a lappie, in your hat, bucket or pillowcase). Look around for mussels – if you’re at a good spot they’re easy to find. Using the blade of your knife, slip it in behind the back of the mussel and cut through the beard (the strands that attach the mussel with super glue-like strength to the rocks). 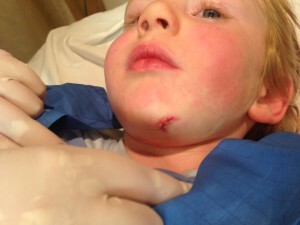 No knife? Grab the mussel and twist it off the rock. Works just as well. Chuck the mussel in your hat, bucket or pillowcase. 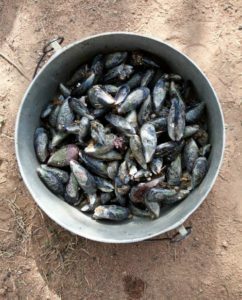 Once you’ve got enough mussels, go back to the shore and tend to your scraped knuckles, then soak the mussels in a bucket of fresh sea water for a couple of hours to allow them time to spit out sand or grit. First, heat up a potjie, chuck in the mussels, the parsley and a good splash of white wine. Put the lid back on and steam the mussels until they open. You can eat some of the mussels straight from the shell just like that – really simple and delicious. But please keep some for the main act. Throw away the ones that didn’t open, and reserve a bit of the sweet cloudy mussel juice at the bottom of the pot. Clean the mussels by pulling off the beards and removing them from the shells. 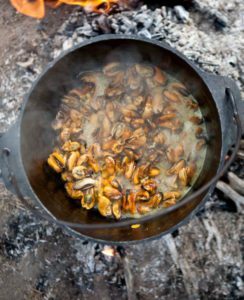 Heat up another potjie, add a generous knob of butter, a good squeeze of lemon, black pepper, crushed salt, the garlic and all of the cleaned mussels. If you want mussels with a bit of a bite, add some chilli and grated ginger and a ladle of the sweet mussel juice. Let it simmer for a moment, give it a good stir, then tuck in. Best served with fresh bread which is ideal for soaking up any juice left behind in the potjie.